TNA is dead and waiting to be buried, and no one seems to notice. That makes Andy angry. Brock shows he can get the upper hand, Cena shows he’s working with a full deck and Bryan shows HHH who’s boss. Raw regurgitated, on the internet, just for you! 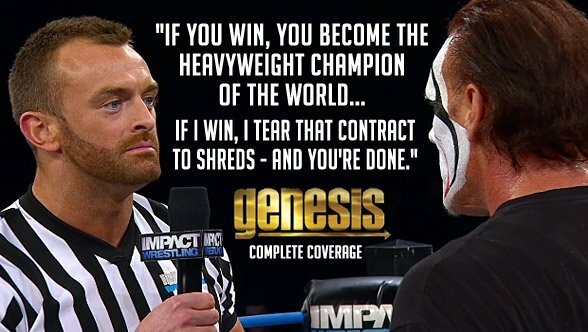 Last week, Dave previewed Genesis, last Thursday’s edition of TNA television, as though it was going to be the first half of a four-hour pay-per-view style show. Instead, Genesis Part 1 was a two-hour advertisement hyping Genesis Part 2, masquerading as an episode of Impact. Dave is not happy about that.